I actually won a giveaway! Among the bonanza of all kinds of Mediterranean dips and chips that recently arrived on my doorstep (thanks to the Foodie BlogRoll and Cedars Mediterranean Foods) were two big tubs of tzatziki – you know, the Greek cucumber-yogurt dip. I wasn’t quite sure how I would use up these delicious, but perishable, gifts until I came across Sandy’s enticing recipe for Baked Falafel on Eat Real. Three thoughts came to mind: 1) what a perfect complement for tzatziki, 2) I’ll bet I could grill that and 3) I’ll bake my own pita breads too! On that last point, I don’t think I’ve mentioned yet that I’m participating in the Bake Your Own Bread (BYOB) challenge this year. The goal is to bake all of our own baked goods (or at least as many as possible) from scratch in 2009. Of course, I still find myself buying bread every so often, but I’ve definitely been baking at home more than ever. The aromas in this kitchen have been just heavenly! My pita breads (pictured above) took so little time to make. With a batch of ABin5 Italian semolina dough ready in the fridge, all I had to do was heat the oven, shape the dough and bake for 7 minutes. Watching them rise was like observing time-elapsed photography – they puffed up quite a bit! They came out so soft and spongy inside, a night-and-day difference from the store-bought kind I’m used to. Making my own falafel was also an easy and satisfying experience. Frying gives traditionally prepared falafel a wonderful crunchy exterior; fortunately, so does grilling. The patties were dense enough to hold their shape on the grill but they still had a nice light texture (no hockey pucks here!). I added chipotles for some smoky heat – they’re not traditional, but I just love the flavor. Plus, the cool, creamy tzatziki takes the edge off the spiciness. These falafel were super-easy to make, quick enough for a weeknight dinner and quite delicious. Place garlic, cilantro, parsley or mint, chickpeas, and bread crumbs in the bowl of a food processor. Pulse a few times to chop and blend ingredients. Sprinkle 1 tablespoon lemon juice over chickpea mixture and pulse a few more times. Sprinkle baking powder, cumin, salt, chipotles, and black pepper over mixture and pulse until the chickpea mixture reaches a workable paste-like consistency. Add an additional tablespoon of lemon juice if it seems very dry. Using a large tablespoon, scoop balls of dough into your palms and form them into patties. Set aside on work surface while you form the remaining mixture. Brush olive oil onto the bottom grate of the panini grill. 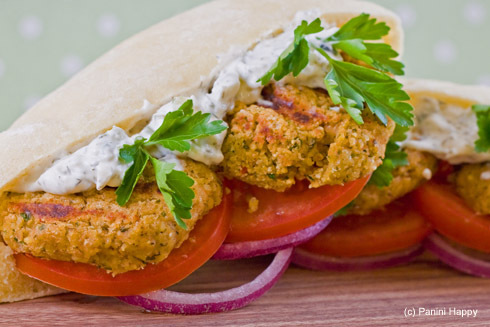 Place falafel patties onto the grill and brush more olive oil directly onto the patties. Close the lid so that the upper grate is touching the patties without compressing them. Grill for 7-9 minutes until the patties are crispy on the outside and grill marks appear. 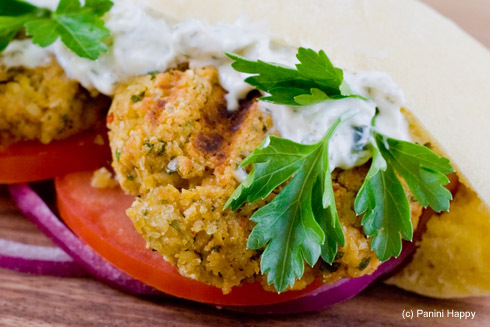 Serve in pita bread with tomatoes, red onions, parsley and tzatziki. * No panini grill? I recommend following Sandy’s original Baked Falafel recipe. This recipe sounds delicious too—I’ve never made anything quite like this…so I’m bookmarking it to try soon! we could put this through the panini press. I want this for lunch today! Kathy, you did such an amazing job with both the falafal and the pitas ~ they look better-than-restaurant-quality delicious! 🙂 Thanks so much for reading (and giving a shout-out to) both of my blogs. I love falafel! When I lived in Chicago, there was a restaurant down the street that served the best I have ever had. Gosh, I miss that place. I have always wanted to try falafel and chipotle is one of my FAVORITE flavors!! Your pita looks incredible. I’ve been trying to make more of my bread too and it is actually pretty fun! LOVE falafel — and this recipe looks seriously good. As a chile-head, I’m really liking the addition of chipotle. Gotta try this! That is the perfect meal! The pita looks awesome…and so does the falafel. Great job here! We’re in BYOB too, but we haven’t tackled anything like pitas! It has to be more than worth it. So delicious. I’ve made my own pita only once. It was time-consuming, and messy. But boy, were they awesome! Warm, puffy, right out of the oven, they were just the best pita ever. Definitely worth taking the time to do at least once. 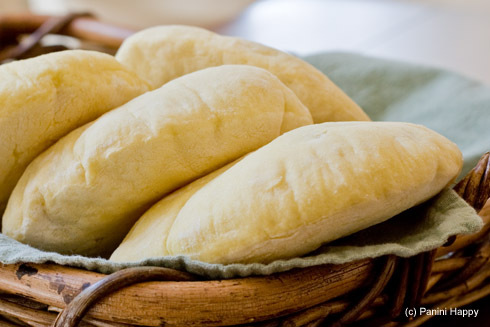 Your pita bread looks absolutely perfect! 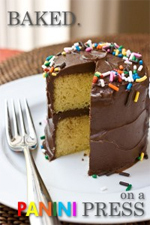 What a delicious recipe, and congrats on snagging up a great prize! Your pitas turned out so darn cute. I totally want to make them now. of all the giveaways to win, you got a doozy! this is like my dream prize, and i really like how you used it. chickpeas in any form combined with a pita is delightful in my book! Another tasty sandwich and a great photo too. Every time I read your blog you get more and more creative! I don’t have a panini press but I’ve been wanting to try Sandy’s recipe for awhile. I remember you mentioning this on Twitter and oh my goodness it turned out perfectly! Your pita are gorgeous. Love the sound of all the flavors in this mixing up and being delicious on my plate. I have been really getting into chickpeas of late and this dish looks great. I love falafel but never make them myself. But now I can. Thanks Kathy! OK, Kathy – I’m back again because I have to tell you that this falafel is still calling my name. Every time I see the title of this post on my Google Reader I find myself drooling. Just thought you should know. 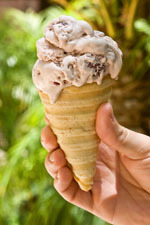 Just saw this on FoodieView, and it looks fantastic!